Outi´s Vibe Body Sound headphones use bone conduction technology to send vibrations through the skull bones directly to the inner ear rather than through the ear canal. Credit: Outi. A new set of headphones can enable music lovers to enjoy their music while still hearing the outside world at the same time. Outi´s Vibe Body Sound headphones use bone conduction technology to send vibrations through the skull bones directly to the inner ear rather than through the ear canal. The Vibe Body Sound headphones aren´t the first consumer product to use bone conduction technology. Some hearing aids, military headsets, and even cell phones have employed the technique, for reasons including the ability to hear better in noisy environments. However, most of these devices have not become very popular, which may be partly due to the lack of voice clarity for some of the products. The Vibe Body Sound headphones use the latest in bone conduction technology to try to have the best of both worlds: high quality music with the ability to carry on a conversation at the same time. Unlike normal headphones that are embedded in your ear, the bone conduction headphones clip on to your outer ear and conduct vibrations through the skin, cartilage and skull bones. The sound completely bypasses the normal hearing route through the outer and middle ear, and researchers have verified the safety of the direct "hearing through your bones" route. When the vibrations reach your inner ear, "you hear them clear as a bell," according to online seller Think Geek. "Feel the music, don´t just hear it. The high-frequency driver rumbles and buzzes on your ear, further immersing you in a musical experience." Even though the headphones are on the outside of the ear, supposedly the vibrations required for the wearer to hear the music are small enough that people nearby wouldn´t necessarily hear the music, too - at least, no more so than with normal headphones. 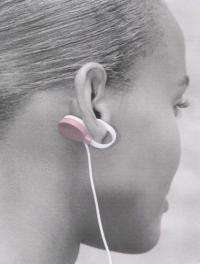 Because the wearer´s ear canal remains uncovered, they´re still able to hear sounds from the environment. While sometimes listeners may enjoy immersing themselves completely in music, at other times, it´s necessary to hear other sounds. For example, the ability to hear cars when crossing the street or hear someone call your name in public can be vital for the safety of the listener and others. Outi also explains that, because the headphones are clipped to the outside of the ear, they avoid damaging the ear like normal headphones. The Vibe Body Sound headphones have three levels of vibration strength that control volume: "Low, Medium, and Tectonic!" The standard 3.5mm jack fits most major portable audio devices. The built-in lithium ion battery enables up to eight hours of listening, and charges via USB in about 90 minutes. They currently sell for $99.99 at ThinkGeek.com. The ONLY consumer voice to use bone conduction? Ever heard of the Aliph Jawbone? Not exactly new. Bone conduction was first used during WWII for pilots (that's around 1945 for the younger crowd who may not have heard of it). Doesn't anybody do fact checking anymore? I think the point is that older versions of this technology weren't clear enough for high quality music, but apparently this is.